Q. What kind of data does the iTrail GPS Logger capture? The iTrail GPS Logger records date, time, speed, direction, and location. This also includes the actual address of stops made. Q. How much data will the unit store? The iTrail will hold up to 120 hours of driving data. Q. How do I retrieve the driving data? To retrieve your driving data, simply connect the unit to your PC with the included USB cable. Q. Does the iTrail GPS Logger need a direct line of sight to the sky? The first time you use the iTrail, you will want to give it a direct line of sight to the sky to let it acquire its first signal. After that, it will not need a direct line of sight. You can place it under your car or inside your car. Every time you connect your iTrail to your PC, it will begin charging. The unit will fully charge in less than 90 minutes. Q. Can I view the activity live or in real-time? The iTrail is a passive GPS data logger, as opposed to an active GPS tracker (which comes with additional monthly fees), so you will only be able to view a historical record (aka "log") of your driving data once you retrieve the unit from your vehicle. The iTrail GPS comes with a 1-year warranty. Q. Are there any monthly fees or activation charges? No. All you pay is the purchase price for the iTrail, there are never any monthly fees or additional charges. Software updates are also free. Included with the iTrail GPS logger, you will receive a protective silicone case, USB connection cable, software installation mini-CD, and quick-start guide. We strongly recommend the magnetic car mount case to mount the iTrail under your vehicle. It takes less than 5 minutes to install the software, and then you'll be ready to log your driving data! Q. Where can I place the iTrail GPS? The iTrail can be placed anywhere in the vehicle, including the glove box or center console. The ideal place is underneath the vehicle using a magnetic mount car case. Q. 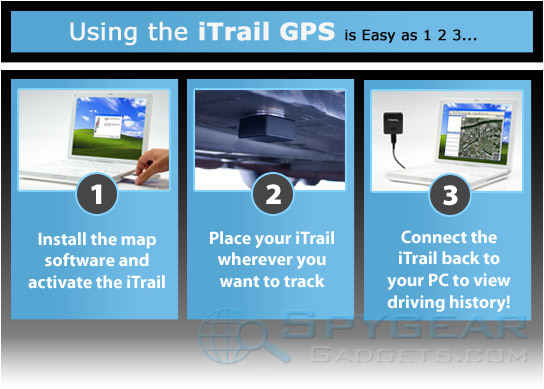 What operating systems is the iTrail GPS compatible with? Currently, the iTrail is compatible with Windows computers only. With normal driving usage (1-2 hours per day) it can last up to 30 days on a single charge. Q. Do I need an internet connection to view the routes/data? Yes - the map software is powered by Google Maps, so you need to be connected to the internet to view the routes. The iTrail GPS Data Logger is the SMALLEST GPS data logger anywhere! It easily fits in a backpack, car, purse, or anywhere that you need to track GPS location of your loved ones, employees, or fleet vehicles. 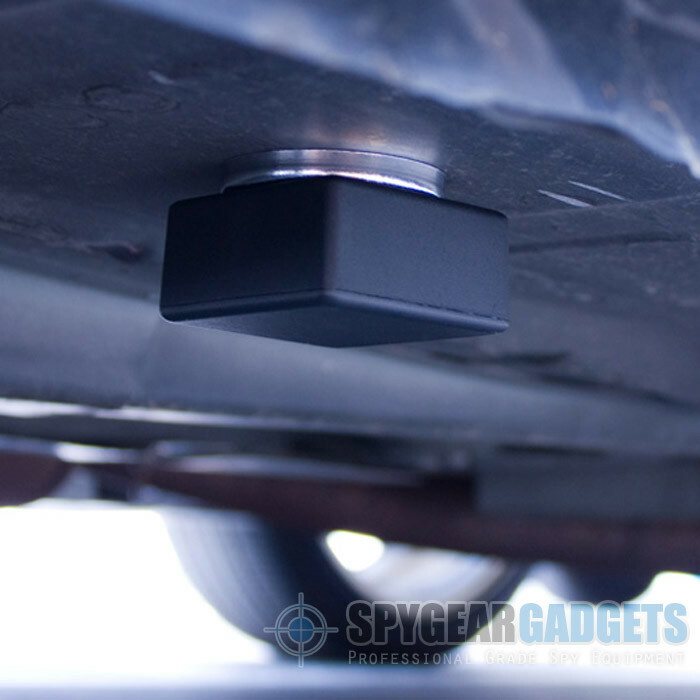 The optional Magnetic Car Mount Case allows you to easily mount the iTrail under your car. The iTrail is a passive GPS logging device, which means that the unit creates a historical log of your vehicle's driving history. To start logging, simply place the iTrail wherever you would like to track, press the power button, and the iTrail GPS Data Logger will start logging driving data whenever the unit is in motion. When you are ready to view the driving history, connect the iTrail unit to your computer to view all of the driving data through Google Maps or Google Earth. In addition to seeing the routes on a map, the custom report feature allows you to create and save printable driving reports in multiple formats, and even allows you to see if or when your vehicle has been speeding. With this powerful reporting process, you can even set "safe zones" or "restricted zones", so that when you run a report, you can see quickly if the vehicle has entered one of these areas.